What is a “reasonable accommodation” in housing? The Federal Fair Housing Act (FHA) is a federal law that prohibits discrimination in housing. One of the many protections of the FHA is the right of individuals with disabilities to request a reasonable accommodation in the rules, policies, practices, or services of a housing provider. Whenever a person submits a request that a rule, policy, practice, or service be changed or modified in some way in order to afford a person with a disability an equal opportunity to use and enjoy a dwelling, such a request is a reasonable accommodation request. Who can request a reasonable accommodation in housing? Individuals who are disabled may request a reasonable accommodation in housing. A person is considered disabled if they have a physical or mental impairment which substantially limits one or more of their major life activities, if they have a record of having such an impairment, or if they are regarded as having such an impairment. However, the definition of disabled does not include the illegal use of, or addiction to, a controlled substance. If the person with the disability is in recovery from addiction, then depending on the facts, the person may be considered as having a disability. In addition, a non-disabled person may submit a reasonable accommodation request on behalf of a person with a disability, provided that the disabled person resides with, or is associated with the person submitting the request. How do I request a reasonable accommodation in housing? A reasonable accommodation in housing may be requested either orally or in writing, and the words “reasonable accommodation” do not need to be used by the individual submitting the request. The individual submitting the request may not be required to use specific forms or be required to follow formal procedures in submitting the request. 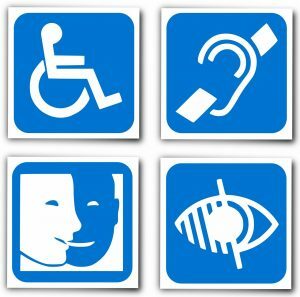 Grid of four symbols indicating accessiblilty features for people with disablities. You can make your reasonable accommodation request orally. However, it is best to submit reasonable accommodation requests in writing so that there is no misunderstanding as to the specifics of the request. You should sign and date the request, and keep a copy in case there is a dispute regarding the request. You are not required to use the housing provider’s forms. What if I do not need an accommodation in a rule, a policy, a practice or a service but instead I need a physical modification to the property because of my disability? FHA also makes it unlawful to refuse to permit a person with a disability to make reasonable modifications of existing premises occupied or to be occupied by such person if such modifications may be necessary to afford him or her the full enjoyment of the premises. It is important to note that such modifications are to be completed at the expense of the person with a disability who made the request, unless the housing is a federally-subsidized, project-based property, in which case the property owner must pay for the modification (this does not include housing that is subsidized by a Section 8 housing voucher). A “reasonable modification” request is not treated the same under law as a “reasonable accommodation” request and there are different rules that apply to such requests. This guidance does not address “reasonable modification” requests. Who must grant reasonable accommodation requests? A reasonable accommodation request may be submitted to any person or entity necessary to afford a person with a disability an equal opportunity to use and enjoy a dwelling, including but not limited to landlords, property owners, public agencies, individuals, corporations, associations, individuals or entities involved in the provision of housing and residential lending (including property owners and brokerage services), and insurance companies who provide property insurance. What process must be used in considering a reasonable accommodation? The person receiving a reasonable accommodation request may not maintain a blanket policy with regards to such requests. Instead, each reasonable accommodation request must be considered on a case-by-case basis to determine whether the granting of the request is necessary to afford the person with a disability who submitted the request equal opportunity to use and enjoy their dwelling. The person considering a reasonable accommodation request may not require any specific forms or procedures be used, and may not require that the request be made in writing or at any specific time or place. In the event that the housing provider (or the person who receives a reasonable accommodation request) decides that the request will be denied, they must first engage in an interactive dialogue with the person who requested the accommodation to explore how an accommodation can be granted. A housing provider that engages in hostile or harassing actions while having an interactive dialogue with the tenant can be found to have not sufficiently engaged in the interactive process and the reasonable accommodation request can be deemed to have been denied. Furthermore, such conduct may be illegal retaliation in violation of the FHA. What types of reasonable accommodations can be requested? The fair housing rules and regulations provide three examples in which a reasonable accommodation would need to be granted to an individual with a disability: (1) a tenant who is blind and requires the use of a seeing-eye dog at a property that prohibits pets; (2) a tenant with a mobility impairment who requires a parking space be reserved for them near their dwelling; and (3) a tenant with a mental disability, who is afraid to leave her residence, to be allowed to pay their rent by mail even though the housing provider requires that the rent must be paid in person at the rental office. It is important to understand that this list does not include all types of reasonable accommodations that must be granted and each request must be considered on a case-by-case basis to determine if granting the request may be necessary to afford a person with a disability an equal opportunity to use and enjoy a dwelling. How quickly must a request for a reasonable accommodation in housing be considered? The person receiving a reasonable accommodation request must provide a prompt response and an undue, indeterminate or unjustified delay may be deemed to be a failure to provide the reasonable accommodation. What types of information may the individual requesting a reasonable accommodation in housing be required to provide? If the individual who requested a reasonable accommodation has a disability that is obvious and if the need for the requested accommodation is obvious, the person receiving the reasonable accommodation request may not request any additional information. If the disability of the individual requesting a reasonable accommodation is not obvious, the person receiving the request may request information that verifies that the individual is disabled as defined by the FHA. However, the person receiving the request may not inquire into the nature or severity of the individual’s disability. The person receiving the request may also request information that describes the accommodation that has been requested and that shows the relationship between the individual’s disability and the need for the requested accommodation. Who can verify the disability of the individual for whom a reasonable accommodation has been requested? This information can often be provided by the individual who has requested the accommodation, such as by submitting proof that the individual receives disability benefits or by submitting a credible statement by the individual. This information can also be verified by a doctor or other medical professional, a peer support group, a non-medical service agency, or a reliable third party who is in a position to know about the individual’s disability. When can a reasonable accommodation request be denied? A reasonable accommodation request can be denied if it was not made on behalf of a person with a disability or if there is no disability-related need for the accommodation. A reasonable accommodation request can also be denied if it is not “reasonable”. A reasonable accommodation request is not “reasonable” if it imposes a fundamental alteration in the nature of the program or an undue financial or administrative burden on the party to whom it is submitted. This does not mean that a reasonable accommodation request may not include any costs for the person receiving the request. However, those costs need to be “reasonable”. 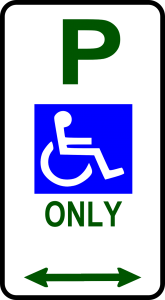 For example, if a tenant with a mobility impairment requests to have a parking space reserved for him or her near the front door, the landlord or property owner is required to pay the costs for any signage. However, if that same tenant requests that an elevator be installed so that he or she can access a second-floor apartment, such costs would likely be unreasonable. May I request to have a service animal live with me as a reasonable accommodation in housing? An individual may request a reasonable accommodation to have a service animal if the individual is disabled, as defined by the FHA, and the animal performs work, assistance, tasks, or other services for the benefit of the individual, or if it provides emotional support that alleviates one or more of the identified symptoms or effects of the individual’s disability. Is there a difference between a service animal, a support animal, an assistance animal, and a therapy animal? There is no distinction between any of these different types of animals when an individual request that he or she be permitted to have one as a reasonable accommodation in housing. They are all considered service animals under the FHA, as long as they provide a service for a person with a disability because of the person’s disability. 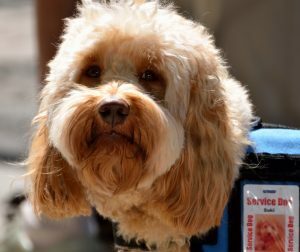 Picture of a dog with wavy hair wearing service animal jacket. The courts have repeatedly held that emotional support animals are service animals and must be considered as reasonable accommodations for individuals with disabilities. May a housing provider require me to pay extra rent, a deposit or a fee as a condition for having a service animal? A housing provider may not require different rent or impose a security deposit or other lease terms because of an individual’s disability. A housing provider may not require an individual with a disability to pay an extra fee or deposit as a condition of receiving a reasonable accommodation. 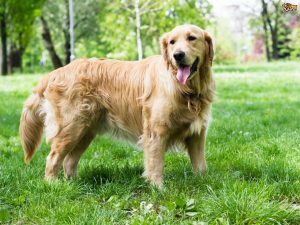 Image of large breed dog with long blonde hair, tongue hanging out, standing in grass. This dog is not wearing a service animal vest. May a housing provider require that a service animal be trained? There is no per se or specified training requirement for service animals and the FHA protects the right to have all types of service animals, regardless of training. Some individuals requesting to have a service animal as a reasonable accommodation in housing may have a disability that requires the service animal to have some type of training (such as a seeing-eye dog for a person who is blind) and in such cases, the individual with a disability could be required to show that the service animal has received such training. However, in other cases, such as for emotional support animals, no training is necessary and the individual with a disability cannot be required to show that the service animal has received any training. 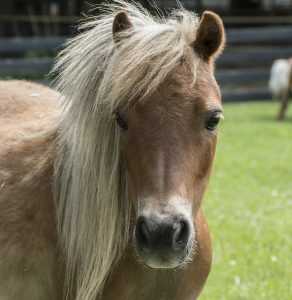 Picture of a miniature horse with blonde mane looking into the camera. 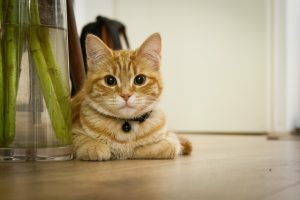 Picture of orange and cream striped cat looking into the camera wearing a collar, sitting next to a clear vase with green stems and water. Picture of white bird of unknown species sitting on a person’s leg, there is a hand entering from outside the frame of the picture stroking the bird’s head. The determination of whether a service animal must be approved must be made on a case-by-case basis after a fact-specific inquiry. Whether a specific animal qualifies as a service animal depends upon the disability of the individual requesting the reasonable accommodation and the accommodation necessary to improve the effects of the disability. May a housing provider impose breed, size or weight restrictions on service animals? A housing provider may not impose such blanket restrictions on service animals. A housing provider must approve a service animal as a reasonable accommodation if keeping that animal is “feasible” and “practical”. A reasonable accommodation request for a service animal can be denied if the animal poses a direct threat to the health or safety of others that cannot be reduced or eliminated by another reasonable accommodation, or if the animal would cause substantial physical damage to the property or others that cannot be reduced or eliminated by another reasonable accommodation. A housing provider must complete a fact-specific case-by-case determination of each specific reasonable accommodation request. Image of pitbull or terrier breed dog with service animal vest on and grass in background. A housing provider may not rely on a state, city or county ordinance banning certain breeds of animals. In the event that a housing provider is aware that a certain animal requested as a service animal would violate a municipal ordinance and this is the only basis upon which the housing provider would deny the request, the housing provider should approve the reasonable accommodation and suggest to the individual requesting the reasonable accommodation that they submit a further reasonable accommodation request to the municipality. Even if the municipality denies the reasonable accommodation request, the housing provider should maintain its approval of the service animal. 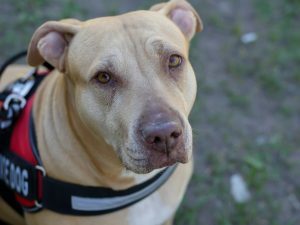 May a housing provider restrict where a service animal is allowed to be present? An individual with a disability who has a service animal can take the animal in all areas of the premises where persons are normally allowed to go, unless doing so would impose an undue financial or administrative burden, or would fundamentally alter the nature of the housing provider’s services. A housing provider may not stop a person with a disability from taking their service animal out of the building and unto the common areas of the property. click here and download will begin.